Capital of Cuberia, my imaginary Steampunk world. - 10 architecture assets, spread via particle instancing (overall count ~3000). - 7 tree species (palms and eucalyptus), 4 other plant species with 6-7 shape variations. - overall poly count: 625,000,000 polys. - rendered with mental ray physical sun and sky. Excellent work, amigo!! Sigue así. With a few tweaks it could be New Crobuzon, from China Miéville's "Perdido Street Station". Lovely, fanciful render. I really like seeing the info on the programs you used and tech data too. Wow, such detailed and amazing steampunk landscape! Man I really love it but it also saddens me. I don't feel like I have good enough artistic visualization to ever be able to do something like this. Anyway.. Amazing piece! May I ask how long it took you excluding the Render time? Also what references did you use for this? Oh awesome! I do hope to get to this point someday Thanks very much. Just be very patient and determined and you'll get there. Also - tutorials! Almost good but a little two-dimensional for my taste. It lacks depth and therefore reality, a rethink required as to lighting and how it is achieved. In addition it is all clustered at the front without an idea as to what would actually be there even in its fictional setting. It feels like things have been just dropped in without thinking about what their purpose would be. Chimneys do not sprout from tree lined areas so they are obviously placed in the landscape for effect. As a result it feels very disneyfied. It is the sort of city a child would imagine not one that an adult would expect even in a unreal and imagined world. Remove some of those trees, bank them up with an industrialised hill complete with factories from which chimneys can spring. Think about the port and whether it would be militarised or commercial, then create buildings appropriate to its use. Remove some of the disneyesque towers... At the moment it is Disney on steroids and although it is almost good, I don't like it and I don't want to live there. Vladmir, what does it take to get permission to use a couple seconds of this piece in a non-web-based video for a project I am doing? It is a great representation for a steampunk city I describe in a live game. It is a very gorgeous steampunk world! This is amazing work! 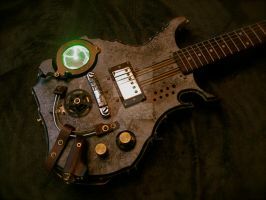 Steampunk rocks! Thanks so much, I am glad you like it! Thats a very fine Picture you have there Sir.